And you wounder why Team Obama thought different and pulled Biden from going to the RNC. Vice President Joe Biden has been in the where are they now files for the past week as the Republican National Convention was successfully going on in Tampa, FL. However, it did not take long for the gaffe prone Biden to, well make another public gaffe.Biden introduces himself to a table of Greek men as Bidenopoulos. Huh? Honestly, these days I am surprised that Biden even knows his name. “Ask George,” he said – unclear who George was, maybe someone at the table –“who’s the most Greek Irishman he’s ever known.” Sounded like Biden was suggesting he is. As stated at Hot Air, this gaffe is some what harmless, but imagine the flack that would have been caused if Biden went up to a table of Rabbi’s and introduced himself as Joe Bidenberg or Bidenstein? Very true. Also, Going up to a table of men and introducing himself as, “I’m Joe Bidenopoulos” is hardly the same as his “put y’all back in chains” comment. One is a silly comment just trying to blend in to the room, kinda like when Obama develops a Southern drawl when he campaigns in the South. The latter “chains” comment is a hateful and divisive attempt to race bait, divide and fan the flames of racism. 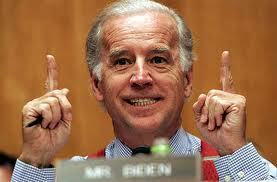 It really is hard to believe that Biden is a heart beat away from the presidency. Democrats made Sarah Palin an issue in 2008, damn these days with Biden I am waiting for him to show up to a campaign appearance without pants. It probably really need to be an issue in 2012 that Biden is hardly capable of stepping into be President of the United States. Country should awaken the sleepy eyed fence sitters. It really is hard to believe that Biden is a heart beat away from the presidency. Two suicide attackers, one driving a fuel tanker, blew themselves up near a U.S. base in eastern Afghanistan on Saturday, killing at least 12 people, officials said. Why isn’t “I’m Joe Bidenopoulos” just as offensive as any other form of racism? Oh that’s right, it can’t be racism unless you are white and the other is black. Pointing out heritage differences is divisive and certainly does not recognize America as the world’s largest melting pot. Check over at Michelle Malkin’s to see all the racists words we can’t use anymore, including “kitchen cabinet”, “Chicago” and “holding down the fort”. SM: KB, I had read that earlier, isn’t it just amazing that Obama, the post-racial President has been the most race-baiting Prez ever. Oh that’s right, it can’t be racism unless you are white and the other is black. with the timing of the speaking (or not). I can barely wait for Biden to have to debate Ryan who can speak and think same time. It is way too late to worry about what Joe Biden will say next. The important thing is just get him out of our government on election day along with his worthless boss and any others like him. It is so scary that Biden is a heart beat away from the presidency. Didn’t we hear an awful lot of that about how scary it was that Dan Quayle or Sarah Palin were a heart beat away? They’re geniuses compared to this guy – it’s not ‘gaffes’, it is lack of intelligence. Biden is scary. He should not be VP.